1. What is an agriturismo? The word is a combination of the Italian words agricoltura (agriculture) and turismo (tourism). Established in 1985 by the Italian government, the agriturismo program is aimed at promoting and protecting rural culture, local food and wine traditions, and agricultural development—while allowing farm owners to diversify their income with tourism. At an agriturismo, you’ll get a slice of rural life away from the bigger cities of Italy and experience the warm Italian hospitality of your hosts. Today, there are over 20,000 operating agriturismos in the country. Read more about agriturismi on Italy’s official agriturismo site. During our stay at Relais Ortaglia, a homemade breakfast spread greeted us every morning in the downstairs dining room: fresh cut fruit from the farm, breads, pies and pastries, cured meats, cheese, yogurts, juices, and more. The owner, Nicola made a phenomenal bruschetta that we’ve recreated often at home: crostini topped with thinly sliced zucchini and drizzled in extra virgin olive oil. His wife Francesca also made us coffee to order: a cappuccino for me, an espresso for Mike. How the two of them had time to prepare lavish meals before we even woke up was beyond us. Hanging onions on the Ortaglia property. Braiding onions provides better air circulation than storing them in a bin. 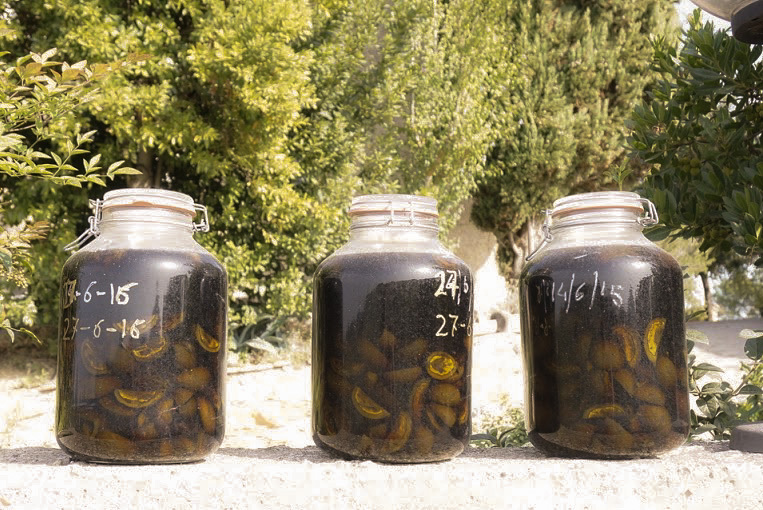 Jars of homemade nocino, or walnut liqueur, in progress. After we’d eaten more than one should when you’re planning to have pasta for the subsequent lunch and dinner, we’d sit down with Nicola, who would provide maps and suggestions on things to do that day. It was hot and muggy in August, but fortunately not rainy. We’d spend the day driving around to other nearby hill towns, like Pienza or Montalcino. Lunch was pasta, always, and a very affordable carafe of wine. We also visited a handful of wineries in the area that Nicola gladly recommended, including Altesino and Casa Ema. Stunning views of vineyards surrounded us at Relais Ortaglia. In the late afternoons, we’d roll ourselves back to the farm, bellies extended, and pour ourselves chilled glasses of crisp white from one of Nicola’s wineries. If you have to take your laptop out and respond to your CMO on vacation, it’s best done infinity pool-side, under the Tuscan sun, with rolling vineyards as far as the eye could see. We loved wandering the hopelessly picturesque property: olive trees and vineyards bathed in sun, beautiful old stone buildings, and chickens pecking around freely. There was also a cozy sitting room with plenty of books, where you could read or relax in the evenings. Though we were only a 15-minute drive from the walled medieval town of Montepulciano, when we were on the property, we felt entirely secluded. What types of accommodations and amenities are available at agriturismi? Depending on the property, there can be individual rooms (with or without ensuite bathrooms), apartments, or complete buildings available for guests stays. At our agriturismo, our room was serviced nightly, like a normal hotel (vs. an Airbnb), and also had a pool—but this is unique to each farm. Most agriturismo stays include breakfast. Many also offer the option to pay separately for on-site lunch or dinner—often made from the produce, eggs, wine, and olive oil from the farm. In many cases, farming is still the primary focus of the agriturismo, so if you’re one to nitpick about slow wifi or a creaky stair, an agriturismo may not be for you. Alternatively, shell out for a luxury agriturismo property that’s run more like a hotel. What kind of activities can you do at an agriturismo? Every agriturismo is different, but some of the common activities available include cooking classes, wine tasting, horseback riding, hiking, and cycling. How much does it cost to stay at an agriturismo? There’s a huge range of agriturismo available for all types of budgets. You can find pretty rustic spots for <$100 USD, or true luxury accommodations for $400+. Ours was a mid-tier option, at about $200 USD a night. How long should you stay at an agriturismo? Many have a minimum of 2+ night stays, since unlike a hotel, they don’t usually have a reception/concierge—the owners are running around doing everything! I’d recommend at least two anyway so you have time to both sightsee and relax. We spent three nights at Relais Ortaglia, taking our time to wine taste and explore all the medieval villages. Should you rent a car to stay at an agriturismo? I’d highly recommend renting a car if you’re planning to spend some time in the countryside so that you can get yourself around easily. Car service or taxis can add up quickly unless you’re planning to spend all of your time visiting one main area or staying right outside a village with a lot to see/do (e.g Siena). Service can be spotty, so be prepared with good directions from your agriturismo hosts and offline maps. That said, be OK with getting lost! With all of the unmarked roads, driving around Tuscany can be confusing—but it’s hard to get frustrated when you’re surrounded by vineyards. Below are several highly-rated farmhouse stays that I considered at moderate price points between $100-200. I’ve included the closest town and the nightly price for a single room, weekend stay in the summer (as of 2018). Some are available on booking.com / TripAdvisor, while others require you to reach out by email. Relais Ortaglia: 5-minute drive to Montepulciano. $200/night. Villa Campestri Olive Oil Resort: 20-minute drive to Vicchio. 1 hour outside of Florence. $150/night. Villa il Castagno Wine Resort: 25-minute drive to Siena. $170/night. Borgo Argenina : 15-minute drive to Gaioli in Chianti, 35-minute drive to Siena. $180/night. Borgo Divino : 8-minute drive to Montespertoli. 45 minutes outside of Florence. $150/night. Agriturismo Il Poggiarello : 35-minute drive to San Gimignano. $130/night. Relais Villa Grazianella: 20-minute drive to Montepulciano. $135/night. Agriturismo Cretaiole: 7-minute drive to Pienza. Prices upon request. P.S. The best places to see the Tokyo's cherry blossoms next spring and the world-famous Santorini sunset.